Menestrelli is a unique dog performance. Professional circus actors, third-generation animal trainers, The stars of the show are jolly poodles. Every dog has its unique role in the show, where each can show its own particular character and artistic talent. Yanina and Sergey used a scientific approach in their training techniques. The training is based on humane treatment of the dogs. All the success of the performance has been achieved because of an in-depth knowledge of animal psychology, without any violence or distress towards the animals. Dogs are more than happy to show their talents in the performance. 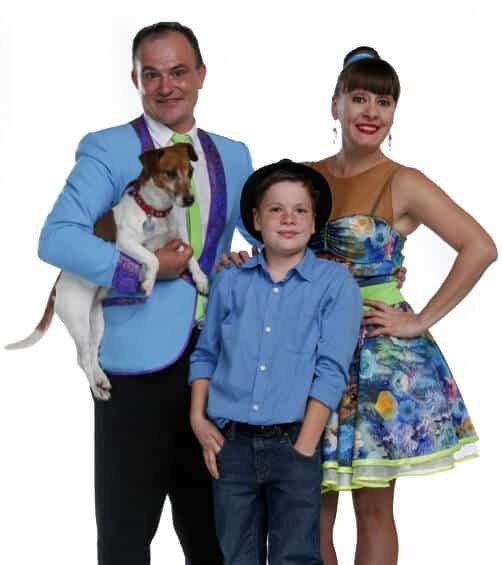 The Circus Dog Show Menestrelli are awardees and prize-winners of many international circus festivals. Our show is the perfect entertainment for: Birthday Parties, Kids Events, Circus Show, Fairs, Festivals, Schools, Carnivals, Church Events, Rec.Centers, Malls, Senior Centers, Summer Camps, and Corporate Events. This is a special dog show with 9 funny and very entertaining dogs. These dogs know how to climb stairs, perform somersaults, and other uniquely designed family tricks. Special show characters may include an inflatable Strong Man, Jack-Dog-Acrobat, and a Stilt Walker. We have experience in every setting from birthdays, corporate parties and even large circus shows. Everywhere! Our performances are unforgettable,spectacular and simply amazing!